A series of rocket attacks have hit hotels and the oil ministry in the centre of the Iraqi capital, Baghdad. 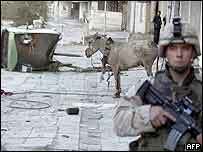 Rocket-propelled grenades launched from a donkey cart hit the Palestine and Sheraton hotels, in a heavily-guarded area in the heart of the city. At least one person was wounded at one of the hotels, which are both used by foreign reporters and US companies. Blasts were also reported at the oil ministry building, where a fire broke out, sending up thick black smoke. Fire engines moved in to tackle the blaze as US troops stood guard. US Colonel Pete Mansoor later said that there were no casualties in the building and the fire was under control, the AFP news agency reported. 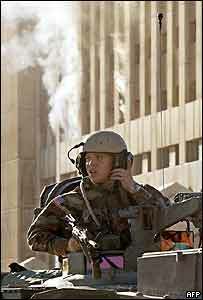 The blasts happened at around 0730 (0430 GMT) on Friday, when most people in the two hotels were still asleep. The Sheraton took a direct hit on the 16th floor, says the BBC's Peter Biles, who was in the hotel when the attacks occurred. 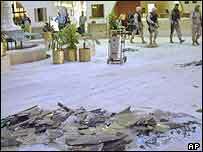 One explosion brought down the roof of the hotel's atrium on the fifth floor, showering the foyer in Perspex and glass. "We saw a big flash - there was just one big bang and then lots of crashing glass," Dihyaa Salem, a manager at the Sheraton, was quoted as saying by Reuters news agency. "There was screaming as everyone left their rooms." At the Palestine Hotel 100 metres away, the impact of a rocket was clearly visible around the 16th and 17th floor. One man was brought out of the hotel with serious blast injuries - apparently from flying glass. "My neighbour's room was hit pretty bad," Steven Akana, a contractor with a US company who was staying on the 15th floor, was quoted as saying by the Associated Press news agency. The two hotels are guarded round the clock and are surrounded by a ring of concrete, in an attempt to deter suicide attackers. According to eyewitness reports, as many as four rockets may have been fired at the hotels at close range by a man with the donkey cart, Peter Biles reports. The rocket-launcher was found nearby on a donkey cart, and the man is now in custody, our correspondent says. He says another two donkey carts loaded with dozens of rockets were found near the Italian Embassy. They were attached to timers but had yet to fire, reports say. "This shows the variety as they (insurgents) try to get one step ahead of us," US Colonel Brad May was quoted as saying by Reuters. "It's certain that you'd have the element of surprise by using a donkey cart," Colonel May added. "This hotel is home to the BBC"